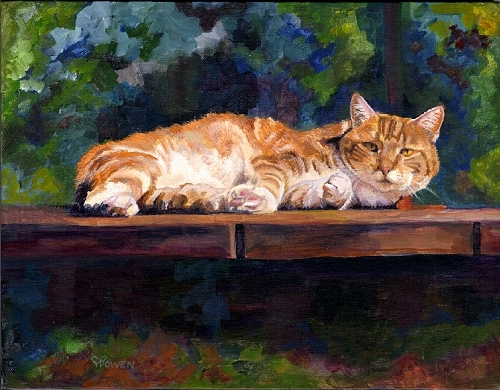 The reference photo for Charlie's painting is on the right. As you can see in the finished painting on the left, I brought more detail into his eyes and enhanced the background. I love to surround the animals with nature. Charlie was from Australia, and at the time of his painting, he had crossed the Rainbow Bridge. 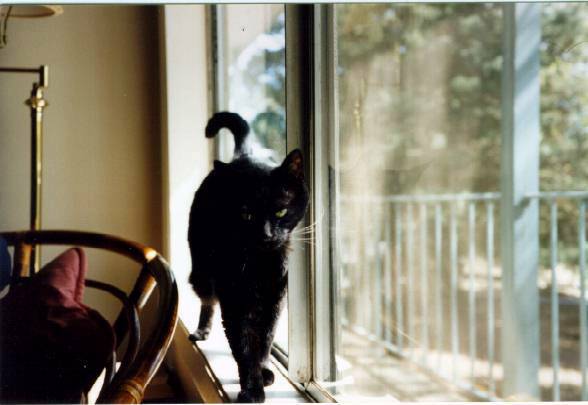 He was a dearly beloved family member for many years. This painting was a gift from one family member to another. One of the reference photos for Sonic's portrait is on the right. I combined two photos to use as reference for the finished painting, adding in a different background than the one shown. I met sweet Sonic at the Lake Oswego Farmer's Market. 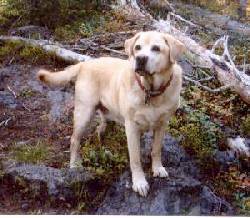 He loves to travel to his second home, a cabin in the woods, and explore the outdoors with his family. 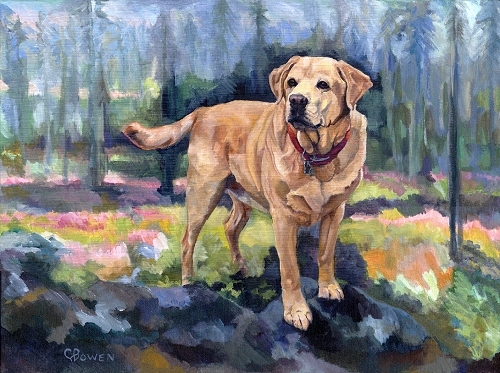 He is a beloved family member and his portrait is a testament to his regal bearing and outgoing personality. 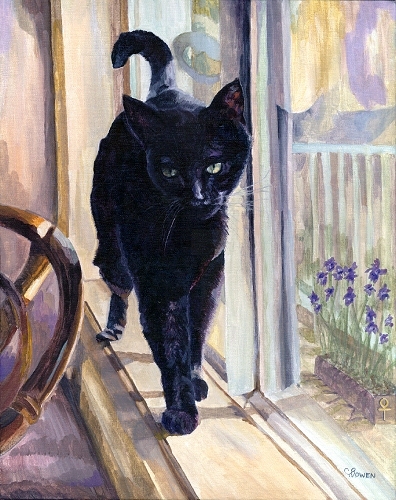 Allyn's guardian came to me for a portrait at the time he was grieving the loss of his lovely cat, Allyn. 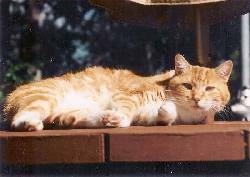 He had chosen the photo he wanted to use, but when we discussed his painting further, this photo of Allyn as a kitten seemed to jump out at us. I had the distinct feeling that Allyn would be happiest if her guardian had this memorial of their life together. 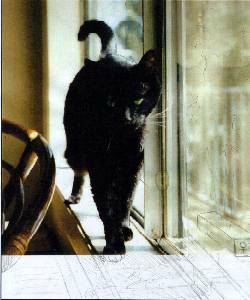 As you can see, the photo was cropped, and I "finished" off the windowsill to bring Allyn up further to more of the middle of the painting. Other details were added as he requested. 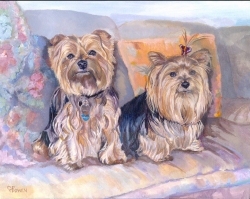 Here are two Yorkshire Terriers, Polo and Tiffany shown below. 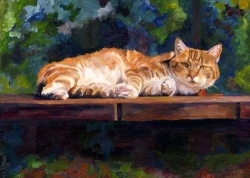 Two reference photos that I used for the Yorkshire terrier painting shown at left. It is a 16x20 size. 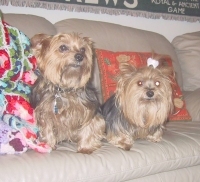 Polo and Tiffany are two adorable Yorkshire terriers. The day I took their photographs they were very excited to see me. Polo, the Yorkie shown at left and Tiffany, shown at the right on their couch at home. 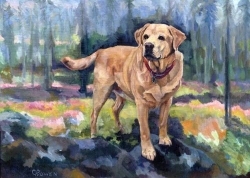 When photographing two dogs, it is often necessary to combine reference photos for the finished painting, as I did here. I used the pose of the photo at the far right for Polo's face and body, and Tiffany's body position. I used a separate photo for Tiffany's head and expression. For smaller dogs, it is easiest to pose them up high, as on a couch, lap or chair. It is always best to be at eye level when creating a reference photo for a painting, with the dogs' noses pointed a little bit down. I decided to leave Tiffany's collar on in this painting. Usually I prefer to paint out the collars, unless they add to the decorative sense of the overall portrait.